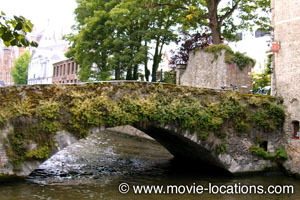 It doesn’t always follow, but In Bruges was filmed in Bruges. If you’ve not yet seen Martin McDonagh’s beautifully scripted and acted, genre-defying, dark comedy thriller (think Pulp Fiction transferred to Father Ted’s Craggy Island) then don’t read on. The locations are so much part of the film that it’s impossible to write about them without major spoilers. On the orders of the mysterious Harry (Ralph Fiennes – way back on form after some seriously dull screen performances), a brace of Irish hitmen are lying low in the Belgian city for two weeks. While Ken (Brendan Gleeson) is happy to relax in “the most well-preserved Medieval town in the whole of Belgium”, the intellectually challenged Ray (Colin Farrell) views the fortnight with undisguised horror. 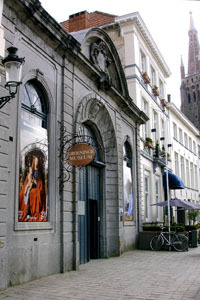 The hotel in which the duo hole up is the Relais Bourgondisch Cruyce Hotel, Wollestraat 41-47, a classy boutique hotel. With its half-timbered frontage and stained glass windows, it’s significantly classier than it appears on-screen. 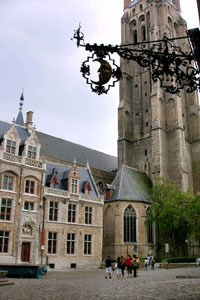 The centre of Bruges – a UNESCO World Heritage Site – is dominated by the Belfry, on the south side of Grote Markt. Ken is keen to brave the 366 narrow steps to experience the must -see view. “The view of down here?” observes Ray, “I can see that from down here.” Ignore the cynicism; follow Ken to the top. 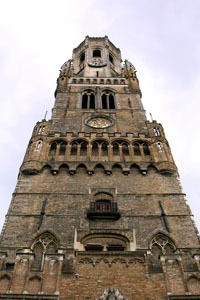 Originally built in 1240, the Belfry was rebuilt after a 1280, and generally added to over the years. More to Ray’s taste is the Belgian beer – or in his cheerfully un-PC words “One gay beer for my gay friend, one normal beer for me”. The bar is ’t Zwart Huis (the Black House), Kuiperstraat 23. Ken’s determined sightseeing takes the pair to a church which holds a phial of the blood of Jesus Christ. The real Basilica of the Holy Blood is one of the places McDonagh was definitely not allowed to film. 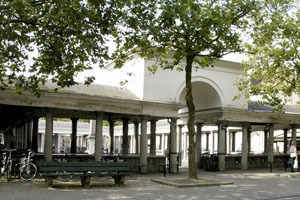 The scene was shot in the Jerusalem Church, Jerusalemstraat at the junction of Balstraat, Peperstraat, Rodestraat. 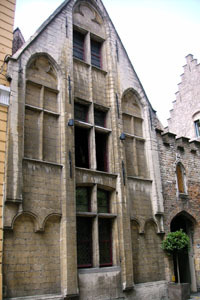 The Jerusalem Church (based on the Church of the Holy Sepulchre in Jerusalem) was built for the Adornes family, merchants from Genoa, in Italy, who relocated to Bruges in the 13th century – and it is still owned by their descendants. 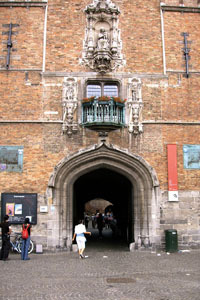 The art museum in which the guilt-stricken Ray is fascinated by the Hieronymus Bosch painting of The Last Judgment, is the Groeninge Museum, Dijver 12. Housed in a comparatively modern building, from 1930, the Groeninge’s collection focuses primarily on works by painters who lived and worked in Bruges from the 14th up to the 20th century. Among other painters represented in the Groeninge is Jan Van Eyck, and it’s beneath the artist’s statue that – suitably chastened by Bosch’s vision of hell – Ken and Ray try to reconcile their chosen profession as they sit in Jan Van Eyckplein. The restaurant in which Ray enjoys his first date with the cheerfully drug-dealing Chloe (Clémence Poésy), before punching out the lights of a Canadian couple, is Cafedraal, Zilverstraat 38. 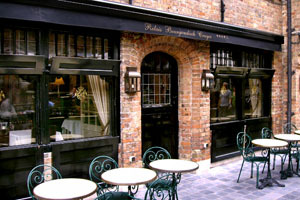 It’s highly recommended as one of the best restaurants in Bruges. After this shaky start to the evening, Ray and Chloe enjoy a bit of a reconciliation on the Meestraat Bridge, between Vismarkt (Fishmarket) and the Groenerel. The film mostly plays fair with names and locations, but one of the exceptions is the house of Yuri on ‘Raamstraat’, to which Ken is sent to collect a gun, which is in fact on Koningstraat. 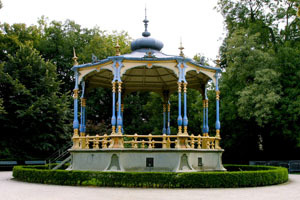 The children’s playground in which Ken stalks his former partner is Koningin Astridpark (Queen Astrid Park), where you’ll find the ornamental pavilion from which he watches the suicidal Ray. With the mission going seriously astray, Harry himself turns up to take things in hand, striding purposefully across the Minnewater Bridge. The artificial lake of Minnewater (translating as ‘Lake of Love’), with its park and its swans, will be the entrance to the city for most visitors. The bridge, dating from 1740, provides panoramic views over the town. 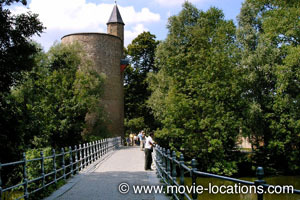 Restricted space at the top of the Belfry meant that the confrontation between Ken and Harry had to be filmed on a studio mock-up of the tower. 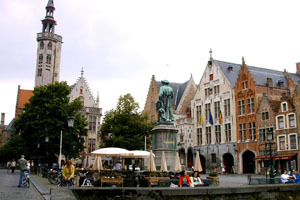 It’s the real Grote Markt, though, into which Ken plummets, and on which Harry spots Ray. The subsequent chase takes Harry and Ray through the Vismarkt, the old fishmarket. Ray stumbles into the ‘Euro-trash’ film set, alongside the Gruuthuse, beneath the tower of the Church of Our Lady. 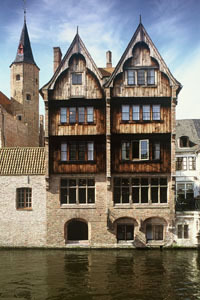 This impressive mansion, which once belonged to one of the richest brewing families of the medieval city, now houses the Gruuthusemuseum, the archaeological city museum of Bruges. It’s here on Gruuthusestraat that there’s a kind of expiation as Bosch's vision of Hell comes disturbingly alive for the wounded – and possibly dying – Ray. • Many thanks to Bart Vanmaele for help with this section.